New York Stock Exchange (NYSE) has launched its new integrated trading technology platform, NYSE Pillar. The new platform enables NYSE participants to connect to all of its equities and options markets using a single specification. The new platform is underpinned by a matching engine – the core exchange software that runs trading – developed by Algo Technologies. Algo Technologies was set up in 2010 by former Chi-X Europe COO Hirander Mirsa and Rami Habib and Alexei Lebedev to target the high-frequency trading (HFT) market. In 2014, the vendor was bought by NYSE. The roll-out of Pillar started in early 2016. In March, NYSE announced the completion of a “key phase” of the project and said it was on track in the testing stage. 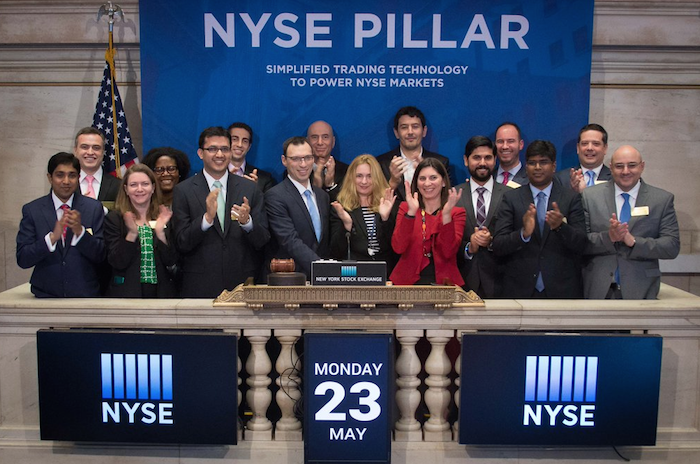 On the 23rd May, NYSE rang the bell in celebration of the launch of Pillar. “Pillar has been designed to reduce complexity, while enhancing consistency, performance and resiliency,” states NYSE. Once completely rolled put, Pillar will enable traders to connect to each of NYSE markets – NYSE, NYSE MKT, NYSE Arca, NYSE Arca Options, NYSE Amex Options, Global OTC and NYSE Bonds – using a single specification and will include new gateways and matching engines. NYSE highlights the benefits of the new platform such as more efficient processing, shorter time to market for ongoing enhancements and simplified, harmonised order types, terminology and messaging across all of NYSE markets. NYSE Arca Equities was first market to migrate to Pillar. NYSE’s plan to overhaul its trading engine with Pillar was unveiled in early 2015. After buying NYSE in 2013, ICE determined that the exchange’s systems were outdated and slow, prompting the acquisition of Algo Technologies, according to Bloomberg. Algo Technologies touted its matching engine as the industry’s fastest.